It would have been incredibly easy for Mazda to ruin the MX-5 by putting a folding hard top roof on it. Just as well then that instead of rushing this concept to market, the Japanese company did a proper job on this car. It's not just an MX-5 with a different roof. Mazda have managed to imbue the RF derivative with a more mature feel without losing the fun factor. More power for the 2.0-litre version is the finishing touch. Cars with folding hard top roofs can be rather grotty things. Curiously malformed with distended bottoms and pinched cabins, they usually lose their looks and their practicality once the roof's up and all you're left with is toothbrush room in the boot once the hood has done its contortionist's trick. Oh yes, these cars offer the customer more. More weight, more complexity and more expense, that is. 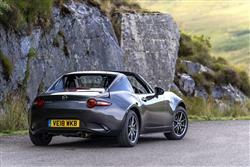 Therefore, we shuddered when Mazda first announced a 'Retractable Fastback' 'RF' version of its fourth generation MX-5. Seems we needn't have worried after all. It's the exception that proves the rule. 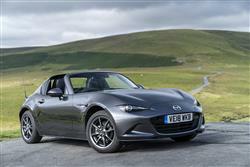 Utilising the basis of an existing MX-5, Mazda managed to build a car that will appeal to a subtly different audience. For many metropolitan types, parking on street is a way of life but the hard-topped RF variant offers additional security and is vandal-proofed in a manner that no fabric-roofed car can be. It's also a little more refined than the soft-top model. 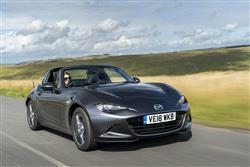 Under the bonnet, this RF model gets the same two powerplants available in the standard MX-5. That means it's offered with either a 1.5-litre 132PS engine or an uprated 2.0-litre 184PS unit. As with the ordinary roadster variant, all models powered by the 2.0-litre 184PS engine feature a limited slip differential and 17-inch wheels. Top versions feature Bilstein dampers and a strut brace to further enhance their dynamic set up. 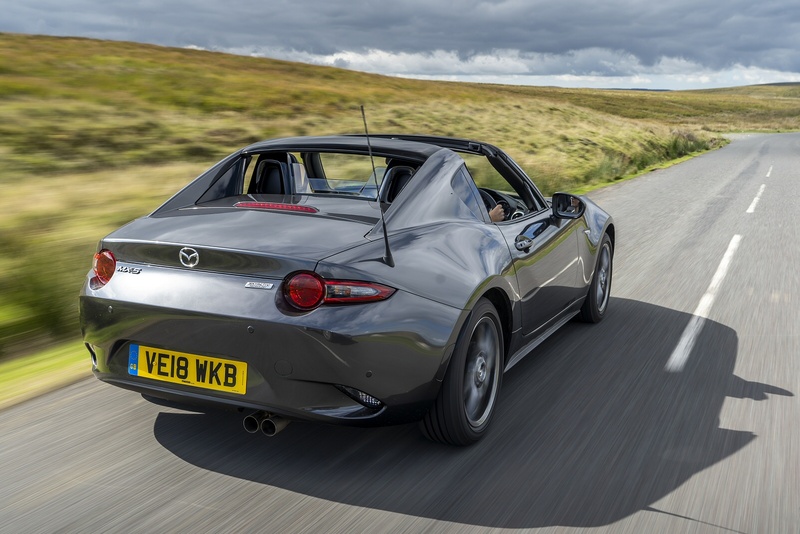 This fourth generation MX-5 design conforms to five key criteria that Mazda claim define this model line - rear drive with a front-mid engine layout, 50/50 weight distribution and an eagerness to change direction, plus a low kerb weight and an affordable price. Most RF models get six-speed manual gearboxes but Mazda is also offering a paddleshift auto option at the top of the range for the few that want it. 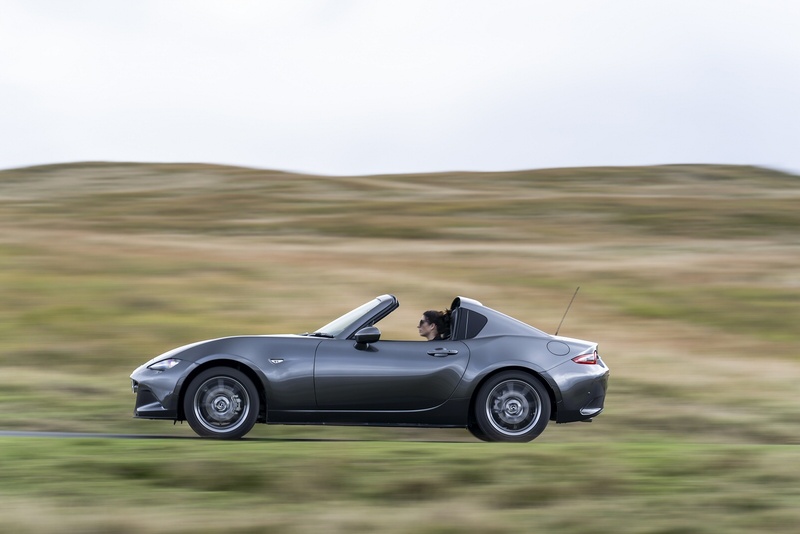 As you would expect, the suspension and electric power steering parameters of the MX-5 have been specifically tuned for the Retractable Fastback version. In addition, a sound-absorbing headliner used in the front and middle roof panels combines with sound insulation around the rear wheel housings to deliver a significantly quieter cabin when the roof is closed. If you want to open the top, this can be done on the move at speeds of up to 6mph. 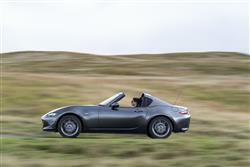 The MX-5 RF's electrically retractable hardtop consists of front, middle and rear roof sections - and a rear screen. When the top is lowered, the front and middle portions are stowed together, while the rear glass sits behind the seats, leaving the rear roof section in place to create a unique open-topped look, plus a cabin feeling that combines a sense of open air freedom with the impression of being securely ensconced within the car. A 5mm increase in roof height aside, the RF retains the same overall length, width and wheelbase as the standard MX-5 convertible, but thanks to gently downward-slopping buttresses that tuck in at the sides to create a teardrop shape, the RF's elegant fastback silhouette accentuates the MX-5's dynamic and contemporary sports car proportions in quite a unique way. Otherwise, things are much as they are in any other MX-5. True to sportscar tradition, there's a stitched leather-trimmed short-throw gearshift lever, with further premium leather on a grippy three-spoke steering wheel that looks and feels great but sadly, still only adjusts for height and not for reach. Through it, you view three satin chrome-ringed gauges, a large rev counter centrally positioned in pride of place. There's a £2,000 premium to order this RF variant over the standard fabric-topped roadster model. That means pricing that starts at just over £22,500 for the entry-level 'SE-L Nav+' variant fitted with the base 1.5-litre 132PS engine. There's a large £2,600 premium to pay on top of that if you want the better-equipped 'Sport Nav+' variant with its Bilstein dampers and a strut brace. In the 2.0-litre RF line-up, prices start at around £24,000 for 'SE-L Nav+' trim and again, you're looking at having to find £2,600 more to upgrade to 'Sport Nav+' trim. 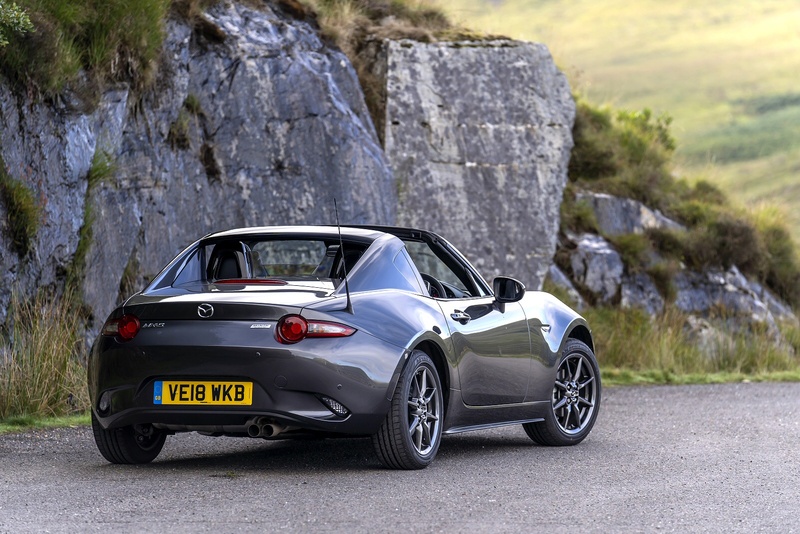 Once you've agreed to do that, you'll be offered the further £1,400 option of automatic transmission if you want it but by that time, you'll be paying nearly £28,000, which some might feel is a little too much for any MX-5. Options are limited to mica, metallic or pearlescent paint, plus on 'Sport Nav+' models, you can add in nappa leather trim and a 'Safety Pack' giving you High Beam Control and Blind Spot Monitoring with Rear Cross Traffic Alert. 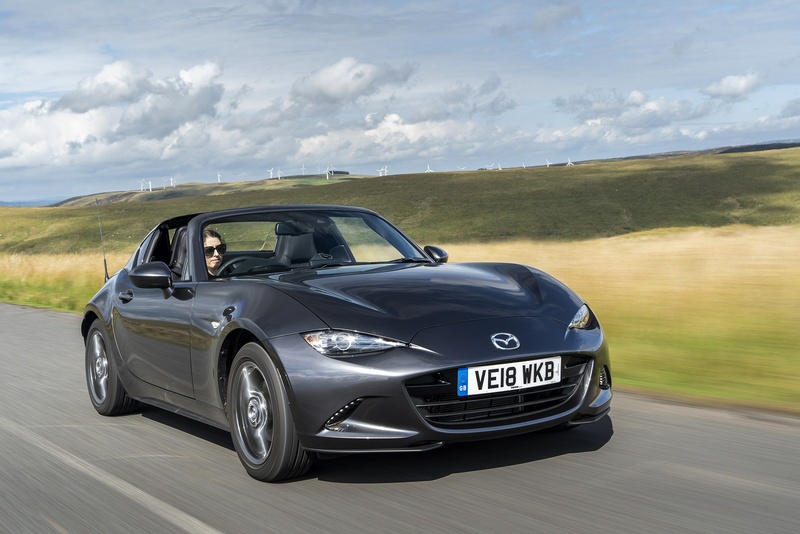 In contrast to the metal folding top 'Roadster Coupe' bodystyle in the previous generation MX-5 range, this RF model's top doesn't add a significant amount of weight to this iconic little car. Which means that in this form, the MX-5 should cost you pretty much the same amount to run as the equivalent fabric-roofed variant. To be specific, the 2.0-litre version most will choose will return a combined fuel consumption return of 40.9mpg and a CO2 reading of 156g/km. If you go for the lesser 1.5-litre model, those figures improve to 47mpg and 143g/km. On to residual values, always a relative strongpoint with this car. Independent experts CAP reckon that after the usual three year/60,000 mile ownership period, this car will retain between 39 and 42% of its original value. To give you some perspective, a premium open-topped sportscar like, say, a BMW Z4 or a Mercedes SLK would give you between 33 and 34%. Yes, something like an Audi TT Roadster would do better, but its higher purchase price inevitably means that you'll lose more money throughout your time of ownership. CAP forecasts suggest that over the regular three year period, the TT will lose over £19,000, well over £6,000 more than the value this MX-5 would shed. Makes you think doesn't it? If you�re looking for a new Mazda MX-5 RF 1.5  Sport Nav+ 2dr Petrol Convertible for sale, you�ve come to the right place. 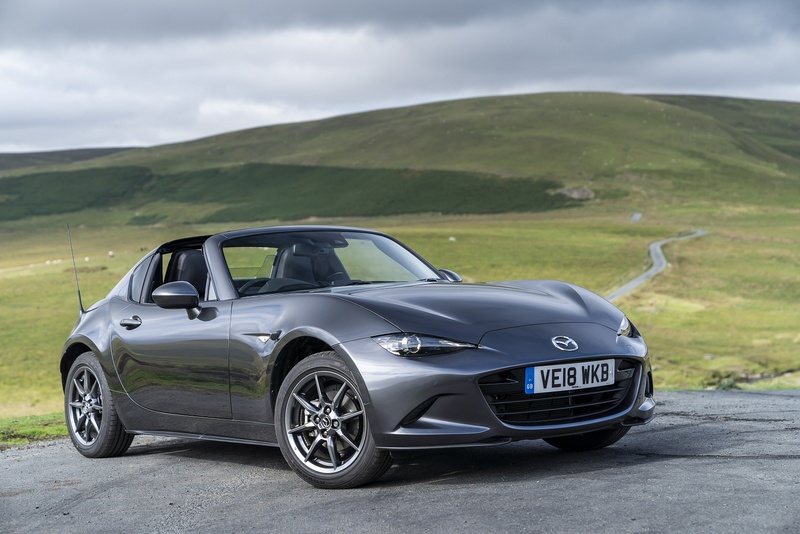 At Bristol Street Motors we don�t just have the best Mazda MX-5 RF 1.5  Sport Nav+ 2dr Petrol Convertible deals, we also offer friendly advice and help with all your enquiries to ensure your buying experience is a happy experience.